Heading to the mountains for snowboarding this spring? Grab a pair of snowboard goggles. 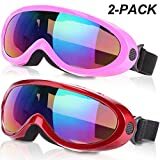 Not only will you need them to protect you from wind, but you will also use the glasses to cover your eyes from snow and cold. Ski goggles aren’t for show. They are beneficial to a skier in a lot of ways. Snowboarding, like most sports, requires clear visibility. Unfortunately, that comes at the cost of glare when you don't have goggles to protect you. When you have proper snowboard goggles, you don't have to squint your eyes to see clearly during daylight. The goggles reflect away unwanted sun rays to keep you focused on the sport. Not every mountain offers smooth slopes that are free of trees and debris. Snowboard glasses ensure you don't trip and fall because a leaf hit your eyes. They protect you against the wind or the cold that can have adverse effects on your respiratory health. It's difficult to view slopes and bumps when everything looks white and snowy in the mountains. 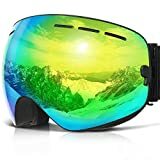 Snowboard goggles help increase the contrast of the view ahead of you. Amber and brown colored glasses enhance contrast the most and can also be worn during different seasons. As a beginner skier, you'll usually hit branches and fall countless times. Snow goggles protect your eyes from getting hit by tree branches or small rocks. Of course, the goggles only work effectively if they fit well enough not to come out when you fall. Snowboard goggles can be expensive. Not all of them fit your eyes and some may not be very strong. Before you order a pair online, ensure they meet the following. Most manufacturers don't specify the exact measurements for snowboard goggles. However, manufacturers specify who should wear their goggles. Glasses for women tend to have leaner frames and less volume at the nose area. Kids’ goggles are light, small and closer to the face. If you wear glasses, there are special goggles known as Over the Glasses skiing goggles. They are large to allow more space to fit your doctors’ glasses. They also have venting pace. An additional type of goggles are oversized with little to no frame but wide lenses. Lenses are either spherical shaped or cylindrical. The latter glasses look flat for the most part but are curved toward the vertical edges. Spherical lenses resemble a sphere and have a more pronounced curve throughout. They are designed to resemble the human eye to reduce distortions and offer better views. Snowsport goggles are designed for many reasons. From protection against bright light to easy detection of bumps, the glasses offer these services based on their level of tint and purposes. 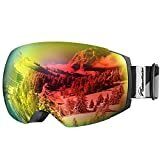 Buy high tint glasses for summer conditions and low tint for evening and night snowboarding. While they are often inexpensive, don’t spend on a pair of goggles than you should. 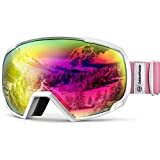 The average price of good quality, tinted skier goggles is $40. Some cost as low as $15 while others cost as high as $140. Snow goggles come in all colors and shapes. Unlike many sports, color can have an impact on your experience using goggles. Amber and brown as we already mentioned enhanced contrast for better views. Black offers the best protection against sunlight but is least ineffective at night. From unisex to gender-specific goggles, tinted to clear, there are a lot of goggles out there. Not all of them are worth buying. The best glasses stand out in both quality and features meant to enhance your snowboarding activities. 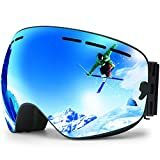 Below are some of the best snowboard goggle brands and their unique features. 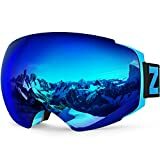 Zionor X4 lenses are unisex, frameless, spherical shaped goggles with anti-fog and UV light protection. They come with adjustable anti-slip straps to fit both men and women and have magnetic technology to hold the lenses firmly. The lenses are designed for high-performance snowboarding and have the build meant to last long. Over the top ratings, easy to change lenses and a near indestructible design makes WildHorn’s goggles some of the best glasses in the market. You pick your design from 10 different shades. If you don’t like them, WildHorn makes it easy to replace lenses with its clip locking system enabled by magnets. The spherical lenses are large and comfortable, strong and durable thanks from their shatterproof poly-carbonate constructions. Hongdak Ski Goggles deliver everything a professional snowboarder would want. They offer fog and UV ray protection. They are scratch resistant, strong and comfortable. Their lenses are detachable and easy to fix. While they are designed with people who don’t use glasses in mind, they take an OTG design. 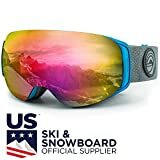 Arguably the best ski glasses on Amazon, AKASO's OTG glasses are rated 4.8/5 from 231 people. 97% of the reviews are either 4 or 5-star ratings. Surprisingly, the glasses cost $39. They offer anti-fog protection. They are unisex, UV rays protecting and helmet compatible. The lenses are interchangeable and their straps are anti-slip designed. More importantly, they are OTG, meaning you can wear them on top of your medical glasses. These goggles are as popular with skiers as the X4. 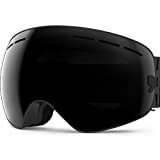 They are large OTG snow goggles, solid and durable. 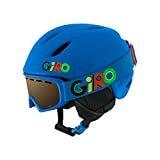 They are compatible with helmets and available in multiple colors. It's up to you to decide which pair impress you more. COPOZZ released the second version of their G1 goggles last year. They offer better performance against fog. They are stronger with better non-slip straps and work for both men and women. Unlike some other glasses, GI goggles don’t scratch and have a high resistance to impact. On top of that, they are OTG glasses that can be worn together with medical eyewear. Bolle Carve's snow glasses are the cheapest top-rated ski glasses online. They are large and beautiful with their edgy curves. They feature a double lens thermal barrier and a venting system to keep your view clear at all times. They work over the helmet and come in a variety of colors. Almost all ski goggles these days come in a cylindrical or sphere shaped design. The circular and oval shapes that once dominated the market are on the decline. Buyers are more interested in viewing angles, comfort, and durability. As such, a spherical or cylindrical shaped pair of goggles should be your choice. You’ll get wider views and better comfort with either shaped lenses. Lens colors define snowboard glasses’ appearances. They also determine optical quality in glasses, something you should care about more. 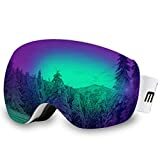 Many people wowed by the outward appearance of snowboard goggles regret later after they are unable to view anything while wearing them. The best way to ensure you aren’t stuck with fancy goggles that have low optical quality is to buy glasses with interchangeable lenses. If you don’t like the views that come with original lenses, you can always interchange them. Someone who’ve never experienced snowboarding may think goggles have little value in the sport. In reality, they are life-saving pieces of equipment you should always have. Their protection against cold, debris, wind and eye damage when you fall can’t be stressed enough. Not every pair of glasses offer proper protection. Invest your time to find great goggles. Snowboard goggles are important tools to anyone who wants to head for the mountains to ski or snowboard. So useful are these devices that you should find great quality glasses with anti-fog and UV ray protection. Most of the glasses are cheap. Make sure you go for the best rated, top quality glasses.